Granite Floor & Benchtop Restoration Services. With over 15 years’ experience in restoring Natural Stone flooring and other surfaces, the team here at Infinity Flooring can hone and polish your tired looking granite floor and benchtops into an oasis of shine and delight. With our customers being the centre of our focus, we pride ourselves on delivering a fast, efficient and an affordable granite polish restoration service. Contact Infinity Floor Restoration services now for an obligation free quote. Perhaps it was the pinnacle of your construction, the crowning jewel which would finally finish the space. It added that long-awaited touch of elegance, sophistication, and poise that your office, hotel, or home had been looking for. Every time you came in, you were able to gape at the flawless finish, stunning shine, and long-lasting quality of the granite, marvelling at its ability to light up a room with clean lines and a stylish aura. It was free from dust and dirt, easy to maintain and clean, and added that finishing element to the overall interior. Over time, your shiny, perfect granite floor or benchtop can begin to deteriorate, reducing its quality and appearance until it emerges as a dull husk of what used to be. Dirt, dust, and the debris of life all make their way into the granite material, leaving it unappealing and uninspiring. Cracks and chips may appear, making it harder to clean and maintain your granite effectively, and you find yourself dreaming of those days when your granite floor or benchtop simply looked amazing effortlessly. 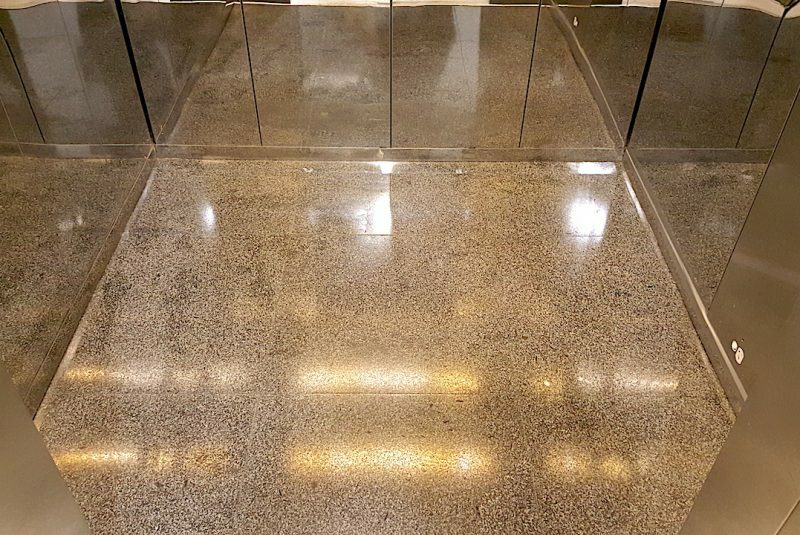 At Infinity Floor Restoration, we could have the granite restoration answer you have been searching for. With experienced, skilled staff exceeding 15 years of granite transformation experience, a variety of different treatments and solutions, and an ethos which puts the customer firmly at the centre, we can transform your granite floor or benchtop from dull and dreary to a desirable delight, all at an affordable price, with our range of granite polishing and restoration services. Being harder than marble, granite requires special treatment in order to achieve the best results, so it is ideal to call in the professionals for this stone restoration service. Bring the shine back into your granite floor – and your life – with a granite refinishing option. Refinishing can remove minor scratches and cracks whilst enhancing extreme shine. The tougher composition of granite means that this can be a cost-effective way of increasing natural shine and injecting vitality. Does Granite polish seem to make no difference to the quality of your floor? Are there unsightly ridges caused by grout which threaten to ruin the fluid perfection? If this is the case, grinding could be the solution. This process flattens your granite floor to the level of the grout lines, making cleaning your granite floor or benchtop a dream and enhancing shine. Again, the harder nature of granite makes this a good option. Granite honing is specifically designed to remove scratches and signs of wear. The process involves removing the top layer of the granite, revealing the fresh, polished surface underneath. Once thoroughly buffed, this creates a flawless, scratch-free finish. Sometimes your stone just needs a chance to let its natural beauty shine through. Having your Granite floor professionally polished by Infinity Flooring, can be a very cost-effective, fast and easy way of breathing new life into tired granite. Professional stone floor polishing can recreate the natural shine, creating a long-lasting effect. Granite can be susceptible to blemishes thanks to its porous nature, and stain removal can be time-consuming, difficult, and expensive. Sealing offers a barrier against environmental damage such as cleaners, dirt, and stains, and makes granite stone floor cleaning an easier process. Again, stain removal is tricky for granite, and this is a task best left to the professional team from Infinity Flooring. Before treating your floor in any way, it is important to start with a deep clean and stain removal. This allows any further treatments to take place on a blank surface, giving them an opportunity to provide full impact. A deep clean can also be an ideal way to freshen up your granite surface between treatments. Spotting and addressing repairs early on could save you time, money, and effort in the long run. It is important to catch any issues such as cracks or chips before they have a chance to develop and make repairs quickly. Not only do they spoil the look of your floor, but they can also cause further damage. The last thing you want is your freshly-treated tiles being let down by grubby grout. Grout restoration provides a facelift, offering a new, fresh, and clean feel easily, as well as helping to preserve and extend the life of the grout. 2018 Copyright © Infinity Floor Restoration. All rights reserved.